WesPac Midstream LLC (WesPac) and its affiliate Clean Marine Energy LLC (CME), announced a construction contract with Conrad Orange Shipyard, Inc., a division of Conrad Shipyard, LLC, to build the first dedicated LNG bunker barge for the marine market in North America. The first 2,200 cu. m. (cbm) barge is expected to be delivered in early 2016 and planned to initially be deployed in Tacoma, Wash., to service shipowner Totem Ocean Trailer Express’s Orca class RoRo vessels, in addition to other LNG-powered vessels. Subsequently the barge will be relocated to Jacksonville, Florida to serve TOTE’s (parent company to Totem Ocean) newbuild Marlin class container vessels and other LNG-powered vessels in the Port of Jacksonville. The LNG barge will feature one tank equipped with MARK III Flex cargo containment technology, from the French engineering and technology company GTT (Gaztransport & Technigaz), to be constructed by Conrad Orange Shipyard under GTT license. Bristol Harbor Group, Inc. will be responsible for the vessel’s design, with the American Bureau for Shipping (ABS) acting as the classification society. This initial bunker barge for TOTE is part of the WesPac/CME plan to provide an integrated LNG solution for engine conversion, infrastructure, supply and delivery logistics to the shipping industry. 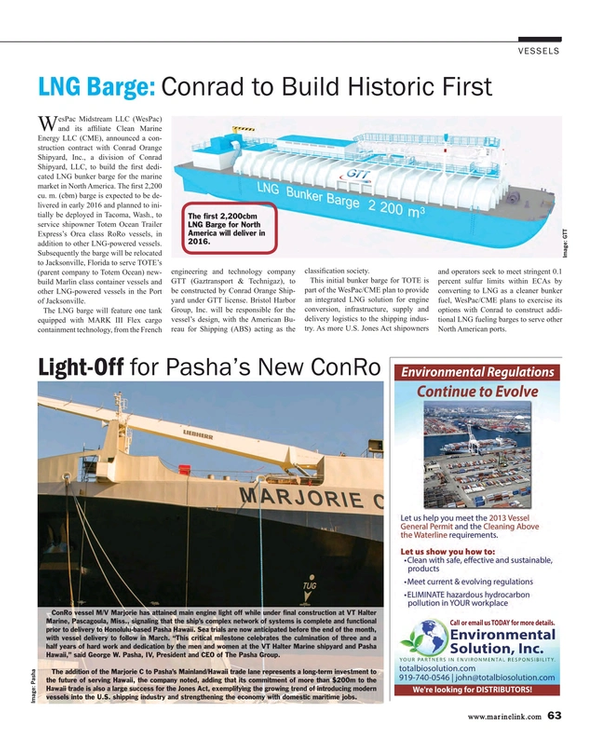 As more U.S. Jones Act shipowners and operators seek to meet stringent 0.1 percent sulfur limits within ECAs by converting to LNG as a cleaner bunker fuel, WesPac/CME plans to exercise its options with Conrad to construct additional LNG fueling barges to serve other North American ports.